If you like to order cocaine with no hassle you need to travel to La Paz, the capitol city of Bolivia. This first in the world cocaine bar have two offers. The first offer is one gram of cocaine for 100 Bolivianos. The waiter will brought clean blank CD, one package with one gram of cocaine and two straws. The second offer is 1 gram of stronger cocaine for 150 Bolivianos. With both orders you will had bottled water on the house. We had all kind of customers. For example a bunch of Australians arrived a week ago and they are still here. They just go out for some sleep and to take some fresh cash from the near by ATM, said Roberto who is one of the waiters in Route 36. If by any case you have been in this cocaine bar a couple of months ago, and you would like to go again, there is big chance you are not going to find it in the same place. The neighbors of the most famous bar in South America are having many complaints so the bar is moving all the time. Since the opening, Route 36 had moved a couple of times. This makes confusion so many people think that there are several cocaine bars in La Paz. Route 36, is not only the first cocaine bar in the world but also is the most famous bar in the world. A crowd of backpackers are arriving from the northern hemisphere just to see and have this unique experience – to be served with pure Bolivian cocaine. One of the backpackers who naturally did not reveal his name commented that the consummation of the cocaine right in the country where is produced is like a fair trade agreement. It is good for the end customer; it is good for the Route 36 and is good for the locals which are producing cocaine. “Anything goes” attitude in La Paz it is not strange if we have on the mind the fact that the president of Bolivia, Mr. Evo Morales has a farm with coca. 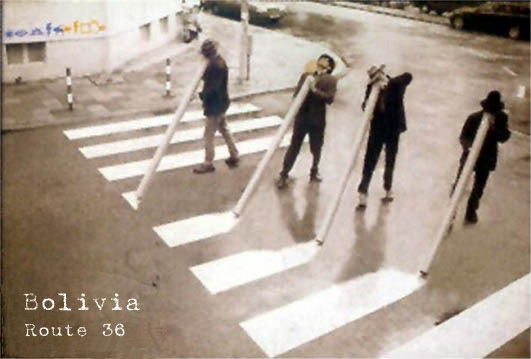 According to our friend in DEA, Bolivia cocaine production is the fastest grooving in the world. State of the art cocaine laboratories are installed and run by the more experienced Columbians. The government is standing aside because the cocaine bar becomes Bolivia strongest tourism point. The new cocaine tourism is not on the large scale but is becoming a point where people are thinking about going in Bolivia. This is a big success if we have in mind that couple of months ago, half of the USA population did not even know that there is country with this name.